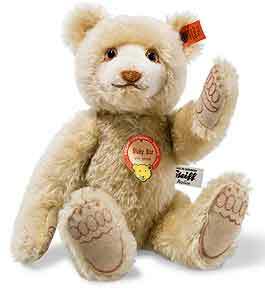 1930 Dicky Teddy Bear Replica by Steiff. This beautiful hand made piece, in blond mohair, wears the white ear tag, signifying this item as a Steiff limited edition, together with the famous patinated steel underscored Button in Ear. Limited edition of only 930 pieces worldwide. Product details: fully jointed (loosely jointed head and arms), glass eyes,wood shavings,with squeaker, size 25cm. Comes boxed, together with a numbered certificate of authenticity. DICKY BEAR REPLICA 1930 Teddy Baby Dicky was a star between 1930 and 1937. People just loved his colourful paw pads and his ever-smiling face. 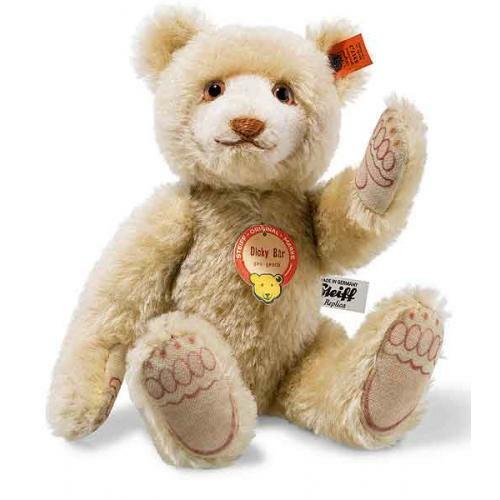 Several replicas have already been made of this very special bear, the first issued in 1985, with further variants following in 1992. This year sees 1930s Dicky making a reappearance – wholly authentic, lovingly recreated based on a historic pattern. As well as two-tone paw pads, he has elaborate airbrush shadowing all over his body and a squeaker. Just look at his friendly face and maybe you will find room in your collection for this revisited classic.